The Georgia Boot 6 " Marshland duck boot is a classic utilitarian boot with premium performance features. The upper is constructed from full-grain SPR leather, far stronger and more abrasion resistant than traditional leathers. It has a mesh lining with cooling fibers to keep your feet a comfortable. Perhaps one of the most key comfort features is the AMP LT insole. This removable footbed is made up of a layer of cushioning memory foam over a polyurethane base, cradling your feet in all day comfort. 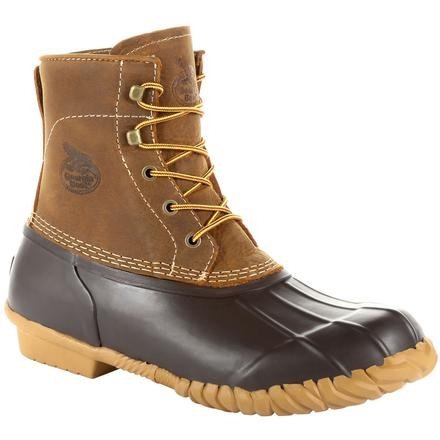 The rubber shell is waterproof and joined to the oil and slip resistant rubber outsole through vulcanized construction. Whether you're looking for a durable farm boot or just a great looking casual boot with supreme comfort, the Georgia Boot Marshland collection is a must try!